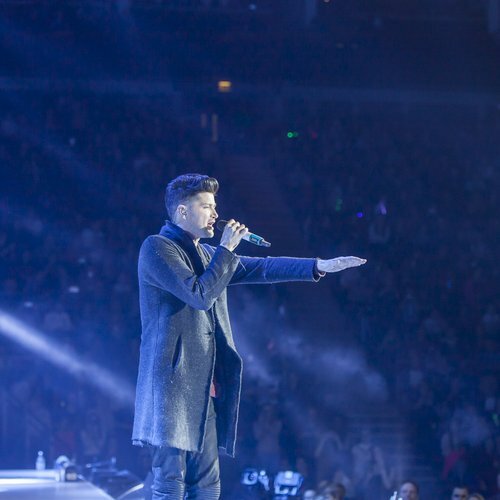 Relive ALL the amazing moments from The Script's incredible #JingleBellBall set. The Script were the second act to take to the Jingle Bell Ball stage to a HUGE scream from the audience - you guys couldn't wait for Danny O'Donoghue, Glen Power and Mark Sheehan to hit the stage! The Script opened their set with 'Breakeven' - and Danny even had a specially decorated microphone with the colours of the Irish flag, bringing a bit of home with him to the stage at London's O2 Arena. Danny got the crowd involved and singing the lyrics back to the band, he encouraged the audience, "Come on help me out let me hear ya... That's beautiful... Come on everybody in the whole place!" - you guys have got some seriously good voices in the Jingle Bell Ball crowd! The O2 was shrouded in darkness before the spotlights illuminated the band for 'For The First Time', which saw Danny step behind a keyboard - he's one multi-talented performer! They then performed their brand new single, 'No Good In Goodbye', with Danny this time showing off his skills with a guitar - there really is no end to his talents! Despite the song only just having been revealed by the band, 16,000 of you knew the words to their soulful break up ballad. It was back to an old favourite, 'Hall Of Fame' to raise the tempo, and the crowds all had their lighters in the air illuminating the O2 Arena with a million lights. Danny also bought his best dance moves out in a VERY fetching maroon sweater before finishing the song a capella. Glen, Mark and Danny closed their set with their comeback single 'Superheroes', you guys in the front were all up on your feet and dancing along as Danny came out into the crowd to dance along with you as the confetti rained down on the audience. Which of you managed to touch actual Danny O'Donoghue then?! @TheScript_Danny @thescript I really wish I could be there!! I you guys! Jingle Bell Ball 2014: AMAZING Saturday Pictures Feat. Take That, OneRepublic And The Vamps!